If you are a regular reader of Naturespeak you are probably beginning to think that I have some sort of opossum fixation about now. 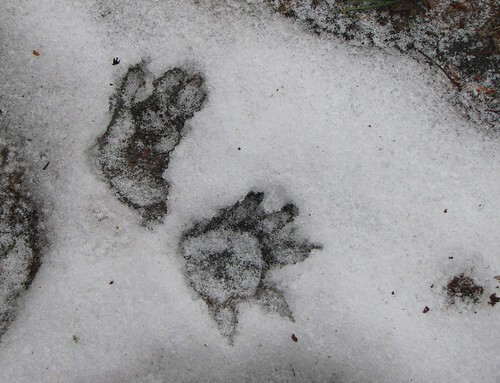 I’ve featured opossums many times over the years and just recently went on a blab fest about casting a ‘possum track in the snow (although technically that blog was about track casting – not ‘possums). But, on the other hand, if you insist on reading this stuff then the blame isn’t all mine is it? Well, you’ve got me. I do like opossums. Love is far too strong of a word. Like will do. As a young lad, one of my favorite Audubon mammal paintings was that of a “Virginia Opossum” plucking succulent persimmons off a branch. There was something exotic about persimmons to my young mind. The fact that they were being eaten by North America’s only marsupial was icing on the cake. I even tried to replicate that image in one of my early paintings, although the creature was placed on a northern black walnut branch instead. It was really easy to get a specimen to draw from because ‘possums were (and still are) born dead on the side of the road. If J.J. Audubon were alive today he would spend lots of time cruising the highways to pick up his specimens – if nothing more to save on black powder costs. If he were in Germany, there is no doubt which stretch of highway he would frequent. There are no ‘possums in Germany, but then again Mr. Audubon would quickly have tired of opossums in the modern age anyway. 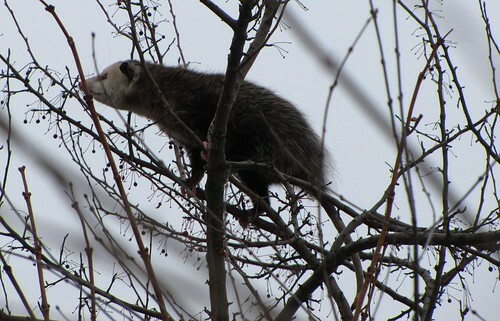 When I spotted a treed opossum recently, I was reminded of these random ‘possum memories and thoughts. Actually the thing was originally pointed out to me by someone else, but so what – I captured the moment. This time I was armed with a camera and my medium was digital bytes of color. The results are much better than my earlier acrylic efforts. I’ve known of this especially large creature for some time now. His meaty footprints were all about the Marshlands Museum grounds every time the winter weather eased up a bit. One of the peculiar traits of his track evidence are the frequent comma-shaped tail drag marks in the snow (see here). All ‘possums leave tail drags, but these were scribed like short jabbing stick marks. Upon seeing the beast in the flesh, the explanation of these marks became quite evident. Like most of his kind, his naked tail is badly frostbitten. The tip is blacken and turned down like a burnt match. This is the portion that pencils in those odd punctuation marks. These animals are still not adapted to northern winters so their naked parts often freeze off. They are natives of the southern persimmon belt after all. 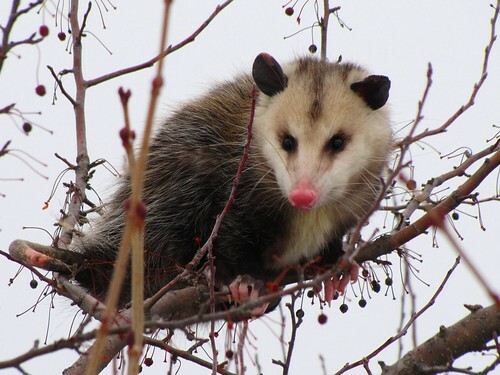 Southern opossums have huge leafy ears and nice looking tails, but otherwise are identical to their northern cousins. There is no need to feel sorry for our local ‘possums, however, because they are tough. They can eat everything and anything – dead, alive, or inbetween. Tiny frozen crab apples will do when fresh persimmons are not available. 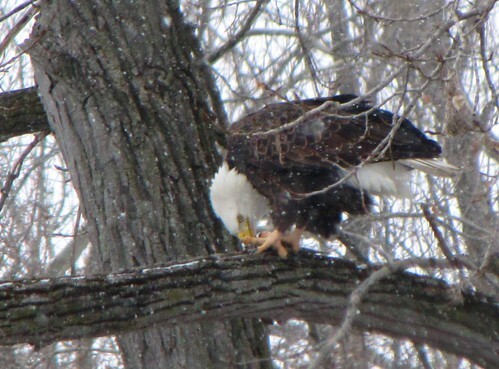 This fellow was investigating the remaining fruits on an ornamental crab apple. Carefully balanced, and well supported by his tail, he would venture out as far as the supple limb would support him. The stalked fruit was pulled closer with a sweep of the paw and deftly nipped off. Here was a living representation of Audubon’s image with the fruit scaled down to Michigan proportions. He paid little attention to me until I approached the base of the tree. He then stopped and, as ‘possums are so wont to do, starred me down. There was no emotion behind those beady black eyes and rosy nose, only patience. He starred at me vacantly and remained motionless until I left (Frankly, he bored me to death which is a ‘possum defense tactic). 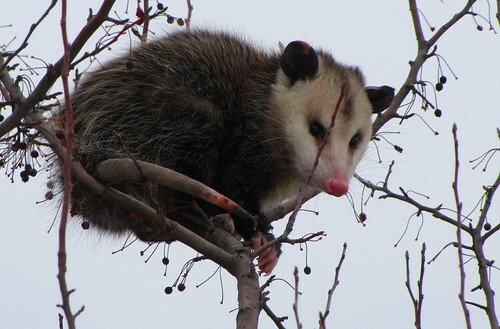 Up close he was an ornamental opossum in an ornamental crab tree – placed there like a stuffed toy. From far away he looked more like a shopping bag caught up in the branches, but a familiar shopping bag. A good naturalist friend of mine showed me a phone text message recently sent from his grand-daughter. She was excited about seeing an “egul” and wondered if that type of thing was common. Given the fact that the rest of her message exhibited proper spelling, we wondered if her “egul” was equivalent to such texting short hand such as “lol” or “luv u” etc. If it was, then it only saved one letter, but it elicited a shared chuckle. There is no denying what she meant. It did get me re-thinking about something, however. The normal response to an eagle – captive, wild, photographic – is almost always something like “ooh” or “wow”. Often an eagle sighting causes reactions of utter wonderment. Folks don’t laugh at eagles. Now, take squirrels. Their very name creates a smile. In fact it is hard to be serious about squirrels. I could tell a joke like “Why did the squirrel cross the road?” and answer that it was because “it was the chicken’s day off” and you have a joke with layers of humor – especially given the fact that squirrels really can’t cross the road. “Why did the eagle cross the road?” simply wouldn’t work. Eagles don’t cross roads (although perhaps eguls do). The last time I saw a funny eagle was in the character of “Sam the Eagle” on the old Muppet show. This dower bird was so humorless and serious about everything that he was funny. He was shocked, and embarrassed, to find out that beneath our clothes we were all naked. Life was “unsafe” for him. Frankly, I thought about Sam when I spotted a baldie fishing on the River Raisin last weekend. The bird flew right in front of me as I crossed a bridge spanning the river. It had the decency to land on a Cottonwood limb close to the railing, and I risked my life and limb by stopping in the middle of the road and firing off a few photos as the bird picked apart its prey. I should also mention that it was in the middle of a snowstorm and that my behavior was “unsafe” (I also was naked under my clothes at the time). My pictures came out o.k., but not great. Rather than write a piece about how eagles fish, or how they eat their prey, or how they are able to scavenge human remains after an auto accident on a bridge I thought a brief section on eagle humor would be a good excuse to post these sub-quality photos. The “egul” incident followed this event and I was quickly convinced that it was high time to let loose with a few bald eagle jokes and see how they fly. 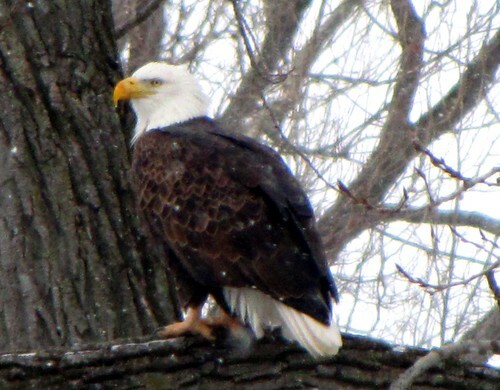 “How do you identify a bald eagle?” asked one novice birder. “They are the ones with their feathers combed to one side” answered the wise old birder. What do you get when you cross a bald eagle with a skunk? Well, you either get a bird that smells to high heaven or a fowl smell. What do you get when you cross a bald eagle with a fish? A slightly fatter eagle. How about if you cross a bald eagle with a cow? Roost beef. What do you call it when a sick eagle throws up? An illegal act! The definition of an eaglemaniac is a bird of prey that thinks very highly of itself. The definition of a beagle is an eagle that barks like a dog. Why do eagles lay eggs? If they dropped them, silly, they would break! What did the eagle say after she laid a square egg? Ouch! What do you call lice on a bald eagle’s head? Homeless. What do you call a line of bald eagles backing up? A receding hair line. O.K., I apologize for that last one (and the one before that). You see, everyone knows that bald eagles aren’t really bald at all so the bald jokes don’t go very far if you really think about them. You see, that’s the problem. Eagles make you think while squirrels do not. 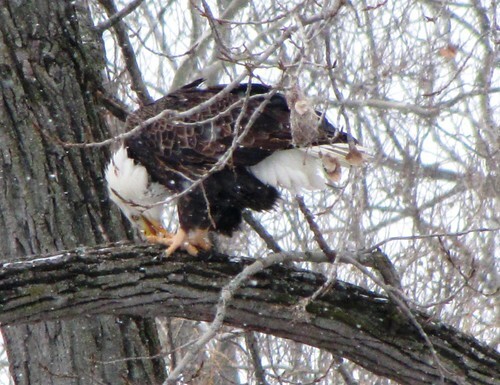 By the way, do you know where a bald eagle goes after it loses its tail? Why, the retail store, of course. Comments Off on R Eguls Funy? As an old-fashioned naturalist I am never content to just look at, or take pictures of, animal tracks. Oh sure, I do take a lot of track photos. It’s an easy, clean, and convenient way to take a track home and I am now spoiled by digital technology. But every now and then I need to get back to my roots and make a few actual track casts. By this I mean pouring plaster into a fresh track, letting it set, and then physically taking the imprint home. This is how I started my naturalist career as a child and I still have some of the impressions I did well over 40 years ago. I also collected animal poo, and I’ll have to tell you about my prize acquisition of a bear dropping (found in the woods- as if to prove that age old question about bears) but that will have to wait. Plaster casting is easy but it is also messy and quite inconvenient. Come to think of it poo collecting is rather messy also, but I digress. 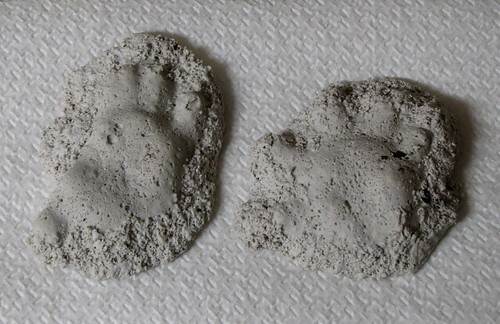 When casting, you will make mistakes and sometimes your plaster mix will be bad. This is probably why some folks regard it as a Boy Scout trick – done once for a badge and never done again. I was a scout long ago, so I am not here to belittle that institution (although to this day some of the worst fire-starters and woodsmen I know were scouts). I am here to show you a track trick which is not in the Boy Scout lexicon. Winter track taking. Every time I see a really nice example of a track I am tempted to cast it. Even a six-toed-cat print may get my attention, although I think it better to simply cut off the cat’s actual foot and take that home. No, not really, my fingers just got ahead of me on the key board – muscle memory you know. Anyway, I usually come up with some such excuse and end up leaving the track (and cat’s foot that made it) behind. I’ll take a picture to fill the creative gap. Last week when taking the garbage out I spotted a ‘possum track in the ice. One of the neighborhood ‘possums is in the habit of checking out our garbage cans on mild winter nights. He is unable to get into the containers, but walks by anyway – perhaps hoping for a miracle of some sort. Opossums dream too, you know. As a matter of fact he takes the same route as the six-toed cat. 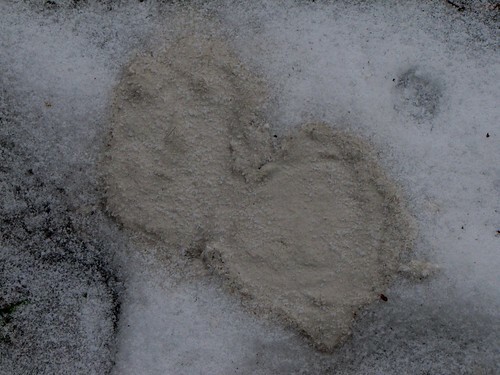 This time the hopeful marsupial walked past when the snow was still slushy, and left his imprint to freeze solid. Here was my track (see beginning photo). I thought that I’d like to cast this one “just because.” Unfortunately the temperature was 21 degrees F and the track was made of water. Plaster of Paris would not work in this case. This compound generates heat as it sets which means the track would melt away long before the plaster hardens. Fortunately, I recalled the Water Putty trick. I remember the first winter track I took. I think I was 8 years old. Somehow a farm duck had gotten loose from one of the neighbors and it walked right through my backyard. I had read about using Water Putty to cast a snow/ice track and decided to give it a go. Because the compound doesn’t heat up, it can faithfully take a winter impression. I tried it and it worked nicely. I dutifully labeled the pulled track as “domestic duck” and added it to my track collection. I have not tried it since. As an adult 8 year old, I ran into the house and pulled down a small carton of Water Putty. Mixing the powder at a ratio of three to one, I produced a creamy pourable mix and gently filled the opossum impressions to over-flowing (see above). Giving it a few gentle jiggles to settle it in, I then left it to set for the rest of the day. In the late afternoon, I poured warm water on the ice, loosened the track set, and carefully pulled it out. The results were pretty darn good (see below). The looser snow produced a grizzled effect that outlined the smoother impressions of the pads. The ‘possums hind foot impression, complete with a thumb print, was the best. So there you have it. Here’s your chance to begin your own trip into track nostalgia. There’s no need to wait for summer as long as there are icy feet trekking through the slushy snow. You might have noticed fox squirrels running about like mad mice lately. They are not rabid or reacting to global warming. No, Fox Squirrels-those large yellow-brown creatures of suburban yard and country woodlot -become hot-blooded during the cold season. They are in the mood for love. You’d think that mid-January would be the single worst month on the calendar to take up reproductive pursuits. This is, after all, the time when wild critters are hard put just to avoid the frigid edge of winter’s blade. Food is scarce, temperatures brutal, and existence is tenuous. None of this seems to bother the winter Fox Squirrel. For them this is spring, dog-gone it! Remember, these are the same rodents that prefer to re-cross the entire width of a road, rather than jump to the nearest curb, when a car approaches. 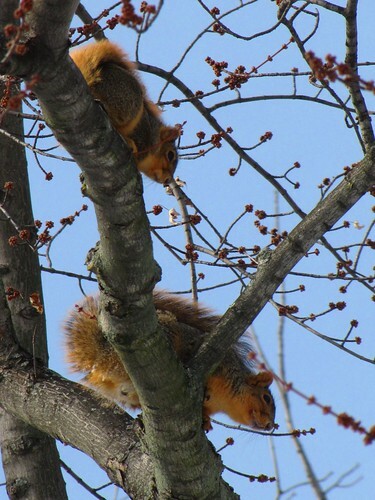 Fox squirrels actually have two peak breeding seasons. The second comes in June – a much more sensible month if you ask me. The early season involves individuals born in March of the previous year. In other words, winter conceived babies carry on the tradition of winter breeding as they mature, while July born squirrlets maintain the early summer breeding schedule. January breeding behavior involves individuals running around like fools, lots of chattering, and a whole lot of tail talk. Territorial males will defend a “ripe” female from all other suitors until she is ready to mate. Since several interested males will hone in on a single gal, the dominant male will engage in vigorous chases and literally stand guard at the base of the limb where she resides. It is not uncommon, then, to see groups of three or more. In these cases, the female will be up the tree and the males will be barking or chasing each other around the trunk. For her part, the female does not permit the dominant male to approach her until the time is right. He has to keep defending his right until she grants it. Eventually she will come into estrous and allow her defender to mate with her. One of the most noticeable features of breeding time is that Fox Squirrels become very expressive. Normally they are the quietest of the squirrel clan and will only bark or chortle on rare occasion (unlike the Red Squirrel which never shuts up). Come high time in January, however, they begin barking, grunting, squeaking, screaming, and chucking. Many of these sounds are directed at opposing suitors, but a few are uttered between potential mates. The female will squeal with disapproval, for instance, if her defender comes too close too soon. The tail becomes a visual signal device to back up the verbal stuff. 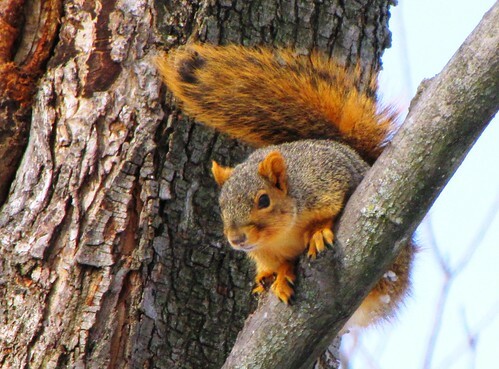 A passive female will sit on the branch with her tail coyly draped over her back (see here) while her defender waves his tail about at opposing squirrels. This appendage is whipped about like a flag in the wind to accompany, and accentuate, the verbal abuse. I can only imagine the kind of trash talk a squirrel could come with. Surely it involves talk about oysters (and, no, I am not talking about the food item). Breeding squirrels are easily spotted because of their enlarged…well, oysters (o.k., testicles – there I’ve said it). When viewed from below these …er, … appendages…are conspicuous. They are black and about the size of a pair of pecans (what else could I use for a size comparison!). After the season is done they shrink down to the size of a peanut. Fortunately, you don’t have to take any of this information without some visual proof. 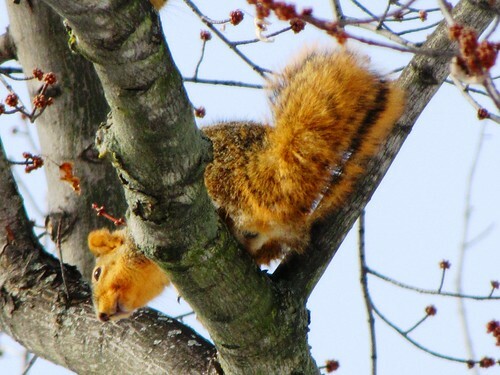 Earlier in the week I stumbled upon an argumentative male Fox Squirrel in my backyard silver maple. He was guarding a female and was in a very argumentative mood. Not only was he flashing his oysters, and flinging smack talk, at a rival male (unseen, but standing at the base of the tree), but he was barking at me as well. Take a look at these two short videos (here and here)– with the sound up – and examine the photos included with this essay and you’ll get a full dose of squirrel love. I did not stick around to see the mating, so don’t expect any shots of that. It was too darn cold and I was freezing my….er, fingers off. 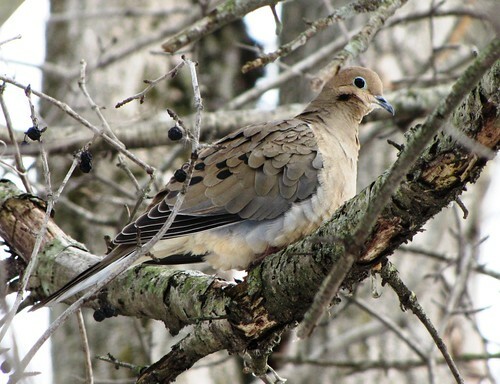 It’s hard to believe that there would be something new to say about Mourning Doves. They are, after all, one of the most widely distributed birds in North America. It is estimated that there are over 400 million of them on the planet and they number as the stars in the heavens. 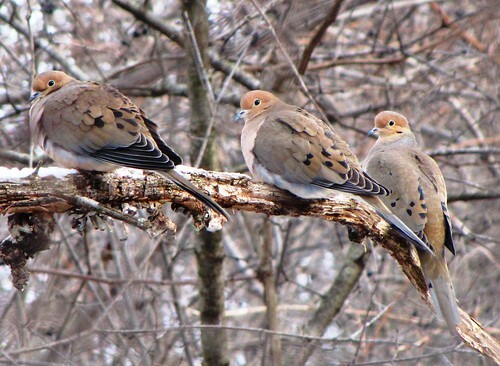 Everyone from east to west is familiar with Mourning Doves. They are common winter feeder birds, common yard nesters, and their “Co-ah coo coo coo’s” are a regular part of the national soundscape. So, when I came upon some roosting doves on a recent cold snowy morning, I was hesitant to take their portrait. I mean, how many dove shots does one need? What intelligent thing could I say about them in this blog that hasn’t already been said? O.K., intelligence isn’t a crucial part of my writing, but I still have to say something. Fortunately, I took the time to stop and observe the gang for some time. Time spent with any part of nature, no matter how seemingly mundane, is always worth the effort. As an observational note, it is worth pointing out that sleeping doves habitually lower their heads down between their shoulders as opposed to tucking them back over one shoulder like other birds. So, even this small behavioral reminder was worth the effort – who knows, that might be a Jeopardy question some day and you might be the contestant faced with answering it. Now, I have something to say about this. You see, our winter doves are not the same as our summer doves. 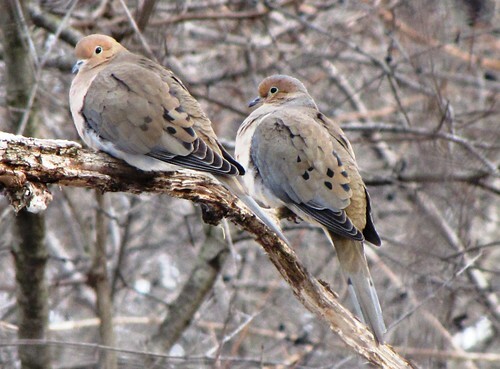 Mourning Doves are an over-wintering species but they are also true migrants. Most of “our” resident doves migrate either to the Texas/Louisiana or the Alabama/Florida regions in the fall. Northern ranging doves then move south into our winter environs to spend the winter. These are likely Canadians (Co-ah coo coo coo-eh) and aren’t from around these parts. They look and act just like our birds, however. There is some evidence that a few of our locals actually stick around as well, but there is no way to identify them other than their slightly dumber look (just kidding). There is one more thing about these Winter Doves. Most of them are probably males. One Missouri study – the “show me state” where everything has to be proven – concluded that the male birds have a higher metabolism than the females. Given this metabolic edge (a 3.8% edge) the males are better able to tolerate the harsher conditions of the frigid north and therefore dominate the winter flock. I did some further work and found that there is still more that can be said about winter Mourning Doves, but I will hold off for now. The factual stuff is fascinating, but it is alright to linger on the esthetic side for once. These overly common, overly familiar birds are pretty cool looking in the cool season. Eh? It was a case of déjà vu that shouldn’t have been – déjà vu, that is. 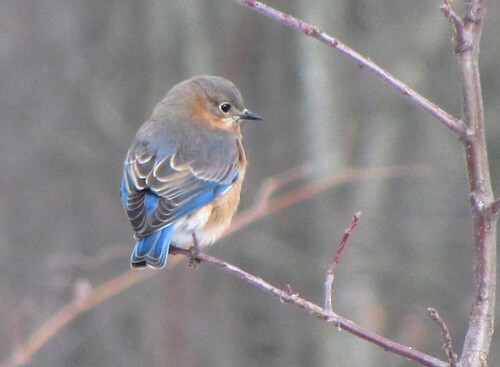 I was at the Petersburg Game Area, it was in the middle of winter and I was looking at a flock of bluebirds. They were feeding among the sumac. Not only did it seem like I was here before, I really was here before. It was here only last winter, as a matter of fact, when I came across a similar grouping of winter bluebirds at this same exact location within the game area. I was expecting a repeat of the place and its sumac shrubbery, but wasn’t expecting a reboot of the bluebird flock, however. I was simply out to try my new camera. Fortunately there were bluebirds shining on me, nothing but bluebirds did I see. The only problem with this scenario is that the birds were, for the most part, co-operating with the bumbling camera operator. They patiently mugged for the lens. They paused while feeding on sumac berries – one of their crucial winter foods – until my pseudo shutter sounded off. Both the somber colored females (see above) and the electric hued males (below) gave equally of their time. As a consequence, I took far too many shots. The only thing left to do was to knit them together into a brief slide show and put them to music (in this case a short guitar ditty I composed last year called “Winter bluebirds”). Take a look and listen here. It’s easy to like bluebirds even when mediocre images of them are put to bad music. Because of their beauty they are on nearly everyone’s list. They are not called BLUE birds for nothing. While technically it is true that their form of blue is a structural color and not a “real” one, it reflects a truly impressive band width of cerulean (that means that all color gets down to reflected light and sometimes it is un-necessary to think beyond that point. This is one of those times). But one also needs to admire them for their toughness. They are resilient and adaptable birds that can laugh at the bitter winds of January and smirk at the deep freezes of February. 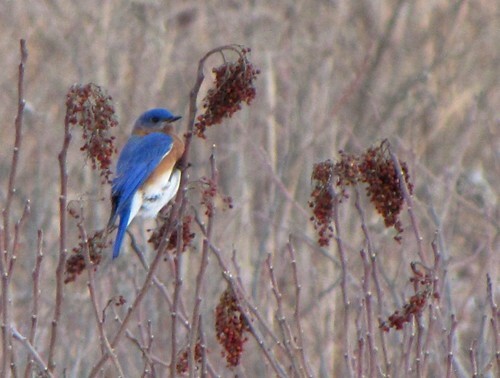 A sizable number of Bluebirds overwinter every year. They are not a sign of spring, they are a sign of life on a gray January landscape. 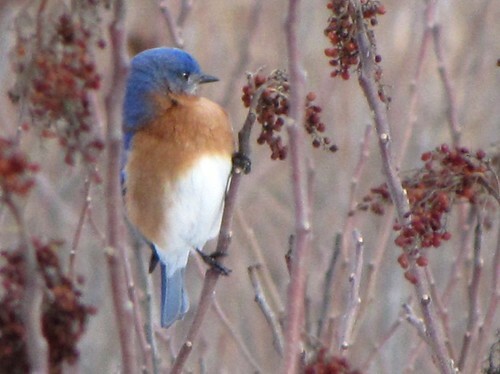 You will rarely see just one bluebird during the cold season. It’s all about Bluebirds, with an emphasis on the plural. Like their relatives, the robins, they become very social when the snow flies. Seeds become their mainstay diet and puffing-up becomes their habit. Winter birds of all sorts puff out their feathers to trap in an insulating layer of air next of their tender skins. Bluebirds are no exception. Although summer bluebird pictures are fine, cold season photos always make them look more like pom-poms. For those who care about such things, the “aw, how cute” factor is increased ten-fold. 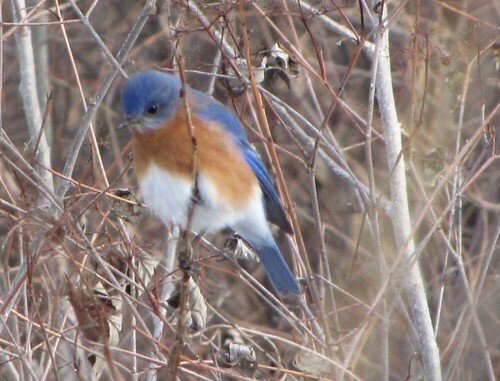 I mean, look at that adorable photo of the poofy male bluebird shown above. Yes, birds that are on the precipice of frozen death are cuter than those lounging in the lap of mid-summer warmth. This factor does not extend to people who turn red faced and snot-drippy when on the precipice of their frozen death. One of the main bluebird defenses against the elements is snuggling. On some bitter cold nights they have been known to pack together into a tree cavity to conserve, and share, their warmth. They will also use bluebird nest boxes for the same purpose. I watched a trio of birds hanging about one of these boxes just a few months ago. They were going in and out of the box as if checking it out for future reference. Wow, I’ll bet if I go back to that same bird house I will have another Déjà vu moment! Wait, I think I said that already. 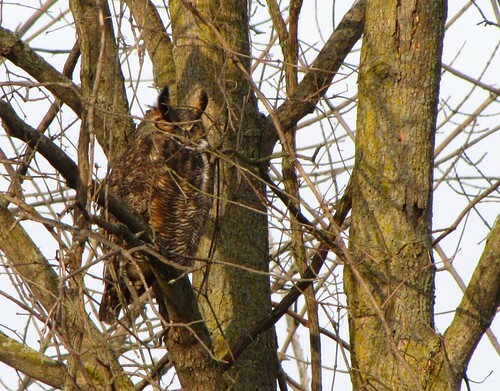 In many ways, winter is an ideal time to be a Great-horned Owl. For starters, it is a season of long cold nights. The midwinter days qualify only as brief spells between the periods of darkness. For a nocturnal beast, this alone must be the closest thing to a dream state. Add to this scenario a cover of white snow to backlight your potential prey, and the inception of the mating season, and you have an owl nirvana of sorts. Like a country gentleman in a bucolic setting of rolling wheat fields and fat cattle, the winter owl is at the peak of his game. This is the owl season. Conversely, winter is a season of terror and discomfort for rabbits and mice – probably dubbed, within their silent thoughts, as the season of gnashing teeth and silent death. Now that I think about it, these unfortunates don’t really have a good season. Every thing eats them all the time. This is why one doesn’t often encounter sleeping bunnies. 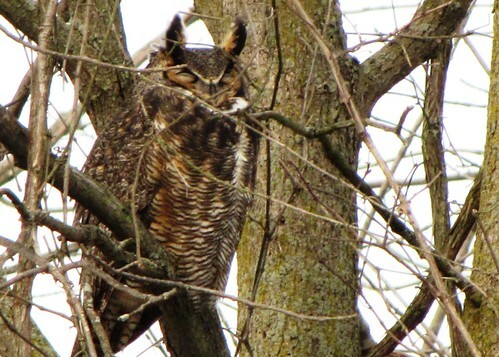 I encountered a sleeping Great-horned Owl the other day which caused me to reflect a bit on his state of mind. The bird was sound asleep and took absolutely no notice of my approach (or departure). The previous evening had been a bitterly cold one and the mid-morning temperature was only 21 degrees F. with no promise of rising any further. But, surrounded as he was in a dense coat of down I doubt he was feeling the chill. Even though he was quite exposed, the day was windless and he was facing the lightly veiled warmth of the morning sun. Every Great-horned Owl becomes a great sleeping owl after the sun rises. These flying tigers rule the darkness, but all their predatory advantages go out the figurative window in the limelight of day. So after a hard days night an owl needs this down time to reflect upon his “owlness.” I do wonder what owls dream about. Looking into the closed eyes of this bird, I believe I can offer a crude human guess. Certainly, there are thoughts of prey. If we go by the average prey percentages, this bird was probably thinking about rabbits, squirrels, mice, and pheasants (in that order). Mammals make up the bulk of the prey of this large owl with birds taking up the slack. I’d imagine visions of deliciously fat and painfully slow moving rabbits clumsily hopping over wide open fields and bite-sized meadow voles lined up in buffet trays. Perhaps a few gifted birds might imagine deadly laser rays shooting from their eyes but we’ll never know. Thoughts of “romance,” the stuff of all dreams, were likely swirling about that tiny brain as well (yes, contrary to their reputation, owls have relatively small brains for their size). I’m sure even the lice living within the owl’s feathers have simple flip-book dreams about other lice, so an advance vertebrate would be spineless not to have full color dreams about romance. Winter is the mating season for Great-horned Owls. They are now establishing pair bonds and will be nesting by the middle of next month. Given the location of this bird, it is no stretch to believe that this is one half of the pair that habitually nests in the cottonwood cavities of the nearby marsh. That great-horns remember their birthing sites is well established. Cavity reared birds will make every effort to nest in cavities while tree nest birds will seek open tree nests. Are there visions of spacious tree holes floating about among those corpulent bunnies? Who knows. Whooooooooooooooo knows! 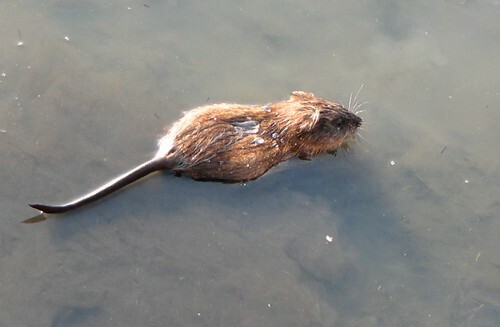 The whole reason for cleaning muskrats is to prepare them for eating, although they are animals that really don’t need “cleaning” per se. They are among the cleanest of beasts – eating a crisp vegetarian diet and obsessively washing themselves whenever and wherever possible. Why, these aquatic mammals even set aside specific bathroom closets within their tunnel systems. If they used towels (and had access to washing machines) they no doubt would change them daily. All of this is for naught, however. When you are called a muskrat, you are a “rat” in the public eye and that is that. It is their reputation that needs cleaning, more than their little carcasses. That, of course, is grist for another time. For the ‘rat cleaning crew at the Monroe Boat Club there was no need for muskrat reputation cleansing. The muskrat reigns king in this place, so fat removal was the only cleaning necessary. Everyone had a good time scraping the stuff off and chewing it at the same time. Our Sunday morning crew completed this work in what was considered record time. My daughter and I probably only cleaned ten of those ‘rats – total – and I doubt we had anything to do with this record-setting pace, but we patted ourselves on the back anyway. We were halfway back home from Bolles Harbor when Katelyn remembered the knives. “The knives…we forgot the knives!”She yelled. We were, in fact, so proud of ourselves that we left the place without my wives’ prize Hamilton Beach knives. More chilling words could not have been spoken. Remember, these were the “I will kill you if you lose them” knives. I turned the car around as fast as humanly possible and roared back to the boat club. Fortunately they were still sitting on the counter and my life was saved. The short return trip was enough to play havoc with my mind as I imagined how my gutted body would look laying atop that stack of muskrat meats. With all my fat scrapped off there would be little left! Even though our work was done, the kitchen crew at the Boat Club was still hard at work finishing the preparation. I suspect they were there for a better part of the day. True to tradition, the cleaned ‘rats had to be parboiled before being stored away for the final cooking at the meal itself. I sheepishly snuck in and whisked the knives off the counter. “See you next week,” I chortled – now confident that indeed I would survive the remainder of the day (and the week). 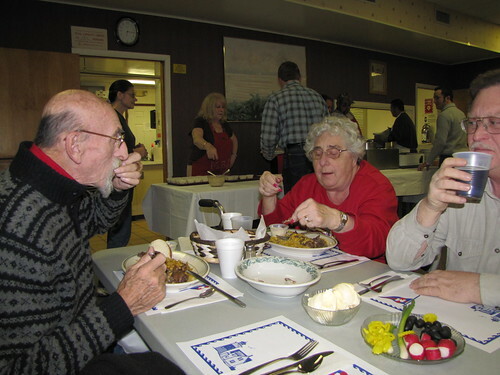 The only thing left to do on this muskrat odyssey was to partake in the dinner itself. This event took place at the Monroe Boat Club on the night of Jan. 3. The folks at the MBC were kind enough to issue me a complementary ticket (for all my hard “work”) and I flashed this pass upon entering the side door. No one was there to look at it, mind you, but I flashed it anyway. Apparently there is little risk of strangers crashing a muskrat dinner even in Monroe. I’ll get right to the meal at hand and skip most of the scene-setting stuff except to point out that the tables were full of hungry participants. I did notice a disco ball hanging from the ceiling but the device was not put to use during the dinner. Unlike most area muskrat meals, this one only offered ‘rat. There were no alternatives such as chicken, beef, or spaghetti to appease those weak-stomached souls from the “outside.”All were here to eat ‘rat and, by golly, it was ‘rat that would be eaten. As you walked down the line, your plate was piled high with one whole ‘rat per serving. 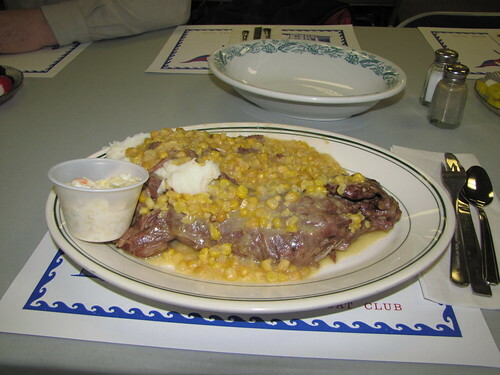 The meats were served from a large cooker and the carcasses appeared to be swimming in a pool of creamed corn. Ample doses of the corn stew were then poured upon the beast and a hefty plop of mashed potatoes was placed next to it. Just for good measure, more corn was dumped upon the potatoes. This is the time-honored way to serve muskrat around these parts. Corn and ‘rat go together like a Hamilton Beach knife and a happy marriage. All that was left to do was to dig in. Although utensils came in handy during the initial stages, especially when eating the mashed potatoes in polite company, muskrat eating is basically a manual sport. Piece by piece the thing is picked apart and the meat literally sucked off the bones. I dutifully picked, pried, sucked and devoured my ‘rat with gusto. Separate platters, placed in the middle of the table for throwing bones, quickly amassed piles of shins, scapulas, fibias, tibias, and rib bones – lots of rib bones- as the meal progressed. Like the newspapers that accumulated the bits of cleaned fat during cleaning, these bone plates told the story of the meal’s progression. They were dumped several times before the dinner was complete. There were two small oddities to report, although they have no real importance other than adding flavor to the experience. We all noted that Ralph Naveaux’s ‘rat was twice as big as everyone else’s. It dominated the plate to the degree that several of us were forced to recall that one of the local marina cats had recently gone missing. Most of us also noted that, for some strange reason, our meals were all missing their right hind legs. None of us had any good explanation for this, especially given the fact that these appendages were present when they were cleaned. I do have it on good authority that small pieces of muskrat meat (such as hind legs, for instance) are useful for luring cats. Out of courtesy, I did not share this observation with Ralph. I realize that there is only so much one can say about a muskrat meal so I will conclude by observing that the meat was dark and sweet and the company was congenial and talkative. This, ultimately, is what muskrat eating is all about. It’s about getting folks together for cleaning, cooking, and eating. It’s about keeping up TRADITION. I am always reminded of the “Fiddler on the Roof” when involving myself in the culinary side of muskrats. As you probably know, the musical centers on Russian peasants fighting to maintain the spirit of their culture through TRADITION! Tevye says (at least I think it was his line) that “Without our traditions, our lives would be as shaky as…as… a fiddler on the roof!” TRADITION! Muskrat eating is TRADITION! Yes, it’s a local thing around Monroe, Michigan and the Detroit Downriver area with origins dating back to the early French settlers. But, let’s save further explanation for now and simply acknowledge that partaking in muskrat flesh binds us to our local French history. When I say French, by the way, I mean French-Canadian and not Parisian French. Those continental French would, likely as not, blurt out an indignant “Sacre bleu” at the very thought of eating anything called a ‘rat. Your average local in these parts – even those of non-French Canadian background -would, on the other hand, shout TRADITION at the very mention of muskrat eating. They, in fact, proudly prefer to shorten the full name to ‘rat (at least in print, the apostrophe distinguishes this rat from the Parisian French sewer rat). One of the first muskrat dinners of the year (and there are many) is always held at the Monroe Boat Club in Bolles Harbor, Monroe. This venerable old club has done this for over a century and, in so doing, has kept that shaky fiddler off the roof. Even though the actual meal is held in early January, the preparation starts immediately after Christmas – usually the day after. My daughter and I participated in the muskrat cleaning process this year as non-club volunteers. She is, by coincidence, a fiddler but this has little bearing on the matter. 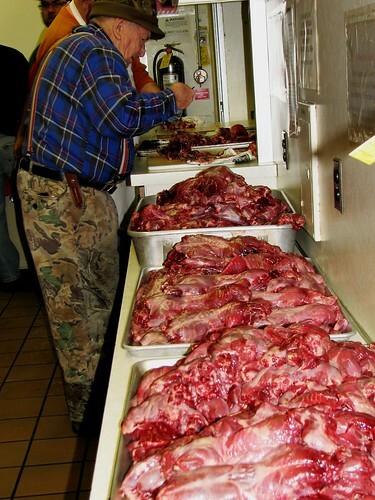 We gathered, along with a dozen or so others, to perform the tedious process of de-fatting and “de-musking” some 200 critter carcasses. 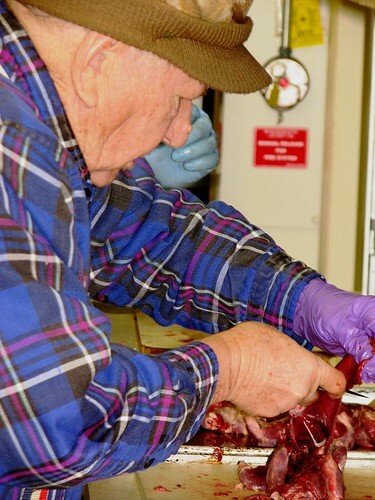 The muskrats themselves were purchased from trappers who skinned and gutted them, but otherwise left them “unfinished.” They process the furs and sell the meats to hungry traditionalists. The ‘rats arrived at the club naked, hollow, and footless but with their heads intact (as a hold-over of another tradition in which the heads were also considered delicacies). By the time they reached our cleaning table, however, the heads too were gone and all that was left to do was the fat nit-picking. This sounds simple enough in theory. There were obvious fat deposits on the flanks, back, and inner backbone that were there to scrape off. These were easily removed. Hidden deposits, tucked under the shoulder blades and deep inside the thigh muscles, were much more elusive. The inner thigh deposit, mistakenly called a musk gland, was the toughest one for me. It took sharp pointed knives to effectively reach both of these locations. Fortunately, the Hamilton Beach steak knives I brought along proved ineffectual and we had to abandon them for some more appropriate cutlery. I say “fortunate” because one of the fellows was wandering around with a whet stone to renew the blades every so often. I was already under the threat of bodily harm from my wife should I somehow lose or forgot those Hamilton Beach knives (she said she would “kill me” if I lost or damaged them, but that was just a figure of speech….right?) and I could only imagine her reaction upon finding them crudely re-sharpened with a whetstone. Even though I had skinned and poked around plenty of ‘rats before (locating the real musk glands which are inside the body cavity), I never did so with the intention of eating my specimens when I was done with them. I found the cleaning process cumbersome. My daughter had never been inside a ‘rat before, but she forged on. While the guys around us flipped and cut and stacked their finished ‘rats onto the tray with surprising regularity, our father/daughter team lumbered through at a rate of about 1 per their every three. All this was performed while engaging in near continuous conversation, I should add. Talking – guy talk – is a requisite part of this process. One does not clean ‘rats in silence. History was the primary topic due to the historical nature of the activity, so I was comfortable with that part of the tradition. I tried to play the line between intelligent conversation and keeping all my digits intact. The fat was scraped onto the blade and then wiped off onto a sheet of newspaper. How fast any one cleaner was performing his/her duty was apparent by the condition of the piece of folded newspaper before them. Your cleaned ‘rats blended into the anonymity of the growing pile, but your paper told the real story of your production. Every now and then, the newspaper would be wadded up and tossed into the garbage as it amassed fat scrapings. A new sheet of classifieds was then laid out to receive further deposits. Let me just say that we changed our sheets only once during the whole time – and that was just to keep from looking bad. My conversation repartee was pretty good, however.